This doesn’t just happen with writing. It happens in all areas of my life. I start to feel like I am wasting my time and effort. I lose steam. When I am doing laundry, mowing the lawn, cleaning my house and feeding my kids, there are days that it seems wonderful and then days that it just seems fruitless. It gets monotonous. Probably because I am doing it on my own – it becomes all about me. I know I have these grand plans for what my determination for God will produce. I want to go on the speaker circuit and speak God’s message. I want to touch thousands of lives with God’s Glory. That just doesn’t seem to be in the game plan for me, so when I realize my small little audience is all I get, then I wonder, should I be doing more? Am I doing something wrong? Doesn’t God want His Word out for all to hear and see? God doesn’t work that way. He never has and He never will. He gently nudges us back to His plan, mostly because we push and pull all the way trying to show God our path is WAY better. We tell God how wrong He is for taking us on this journey and He chuckles to Himself. He knows eventually we will see the Light. He knows that we may just opt for the road that takes us the furthest from His plan (you know the so called “shortcut”). Yep, He knows all about how we try to detour from the traffic of life. It makes Him laugh because He recognizes that if we truly love Him, we will find our way back again to His path. No worries, I will find my way back to God’s path. Most likely it will even be today. God has a plan for me. It may not involve large audiences and big bucks, but it will involve His praise and thankfulness in heaven. I have to tell myself each day – that is all that matters. I want to face God and tell Him how much I love Him and devoted my life to Him. While I tell Him those things, I want to be smiling with joy and no regrets about working for God every day of my life. He is the best boss I have ever had, and he certainly doesn’t apply the pressure or make me think that I am not good enough. Just the opposite, God tells me constantly to stop putting so much pressure on myself and to live in the moment. Love God, love my family and live in the Truth – that is all He cares about. This entry was posted in Faith, Family, God, Jesus, Religion, Social Justice, Uncategorized, Women and Christianity and tagged blogging, Faith, God's will, path of life, self appreciation, speaking, Truth, writing. Bookmark the permalink. Don’t feel defeated! I did a random search for “faith” and found your blog. 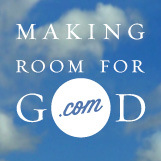 🙂 “Making Room for God”. Sounds wonderful. I don’t have a large audience either; no one really cares much for sufferers of mental illness or those who live by conservative and Christian values. It’s not ‘popular’. PEH. As long as we know we hold the truth, we’re good to go. Thank you! You are so right. My inspiration has always been my 8yr old who suffers from extreme anxiety and depression. She is my Glory. There are so many out there that need to hear God’s Words and are in a situation just like me – trying to do my best to raise my kids as Christians – conquering all their issues with God! Aw, man. 😦 Sorry to hear that. That’s got to be so tough. I did too, since I was young (still do). Except in your case, you, the parent, actually know about. (My parents seemed to be blind until I was voluntarily hospitalized for being suicidal). Nice to hear SOMEONE is infusing their kids’ lives with the Love of Christ. That seems to be less and less common these days. Kudos to you! I’ve definitely been here before, more than once. And each time God reminds me that I need to be faithful to Him in the little that I do and not be discouraged just because things don’t go the way I want them to or I don’t get the response I expected. His plans are so much better than our own, and often times they take us on roads we’d never choose to travel if it were up to us. Awesome message! I was just feeling the same way and your words help make it so much better. God has a plan. I just have to hold on.